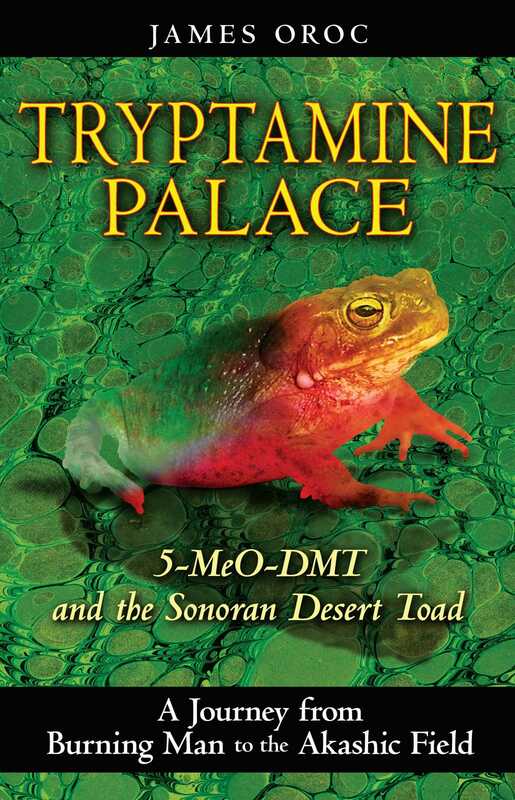 The venom from Bufo alvarius, an unusual toad found in the Sonoran desert, contains 5-MeO-DMT, a potent natural chemical similar in effect to the more common entheogen DMT. The venom can be dried into a powder, which some researchers speculate was used ceremonially by Amerindian shamans. When smoked it prompts an instantaneous break with the physical world that causes out-of-body experiences completely removed from the conventional dimensions of reality. In Tryptamine Palace, James Oroc shares his personal experiences with 5-MeODMT, which led to a complete transformation of his understanding of himself and of the very fabric of reality. Driven to comprehend the transformational properties of this substance, Oroc combined extensive studies of physics and philosophy with the epiphanies he gained from his time at Burning Man. He discovered that ingesting tryptamines unlocked a fundamental human capacity for higher knowledge through direct contact with the zero-point field of modern physics, known to the ancients as the Akashic Field. In the quantum world of nonlocal interactions, the line between the physical and the mental dissolves. 5-MeO-DMT, Oroc argues, can act as a means to awaken the remarkable capacities of the human soul as well as restore experiential mystical spirituality to Western civilization. If it were not for the following two experiences, I may have continued smoking 5-MeO-DMT with the same carefree abandon that marked this first three months. But as fate would have it, the character of my 5-MeO-DMT experiences was about to change. The first of these experiences is my most sacred tryptamine experience of all. It challenges the last shreds of my worldview so soundly and touches a place so deep inside my soul that it is hard for me to share. This 5-MeO-DMT experience began at close to midnight on October 30th in New Orleans, in a neighborhood famous for its association with Haitian voodoo. I was with an old friend, Rene, who was completely sober at the point that I inhaled the 5-MeO-DMT while sitting cross-legged on a couch opposite her. On this occasion, I sailed through the usual progression of steps, and I remember hitting the stage during which the enormity of the knowledge and the timeless nature of my environment frightens me into a return to my physical form. I recall opening my eyes at that point, before bursting into a realm that can only be described as pure light. But this was not ordinary white light, nor even the white tunnel that I dissolve into when I exhale; instead, it was a fractal-filled prismatic light of indescribable radiance and beauty that pulsed with its own intelligence. I then inexplicably felt a strong sense of the presence my friend Brigid, who had died several years earlier. It was as if we were walking together, hand in hand, through towering shadowy trees on a field of stars, and she was laughing, her smile radiant. This was not a memory, but a feeling of actually being there with her. At this point Rene came over and sat down beside me where I lay and gripped my arm quite hard. I realized that her face was covered with tears. “There was a woman in the room,” she said, as she wrung her hands with her eyes closed, seemingly occupying some place between two worlds. “She was young and beautiful. She was laughing. And she wanted to tell you that she was sorry she did not get a chance to say good-bye, and that she loves you. She is still here, but she’s fading away.” Rene went on to further describe my dead friend’s appearance and personality as if she knew her. She was obviously agitated and very emotional. Rene’s version of the events went like this: After I exhaled the 5-MeO-DMT, she saw a beam of light the size of an American quarter come out of my chest, and then I split into two perfect copies of myself, sitting side-by-side on the couch. Since she was completely straight, she found it hard to believe what she was seeing. Yet she said that she could open and close her eyes, rub them, and the vision was still there --apparently for a period of several minutes. This is when the spirit of my dead friend suddenly appeared: an encounter she described in convincing detail. Rene did not know my dead friend at all, nor do I ever remember mentioning her. Rene is a mother with a grown son, and she was completely sober during my trip. But if you had walked into the room, you would have sworn that she had taken some kind of a drug and that I was the sober one. I had no idea what to think, since I did not believe in life after death. I have always felt that I had a strange karmic bond with my beautiful friend who died, and I had last seen her in New Orleans. A few years earlier, I attended my first Mardi Gras. On its climactic final day--Fat Tuesday--I was standing on the street watching the Zulu parade when a sudden deep depression descended upon me, causing me to cry. My friends were concerned, but I managed to shake off this severe feeling and made it through the rest of the day with just a general sense of unease. The following week I telephoned my home country to check on a pair of old friends who were expecting a baby. Upon hearing that their bouncing baby boy had been delivered premature but fine, I breathed a sigh of relief. Then I asked, for no real reason, if my friends had seen Brigid recently. Complete silence was the response before my friend told me that Brigid had died suddenly of a brain embolism. He had assumed that I had already heard. She had died on what was, on the other side of the world in New Orleans, Mardi Gras day. Coincidences like these occur naturally enough in life and can easily be discredited by logical disbelievers. I certainly would not consider this a proof of any kind myself. But whatever happened between Rene and me while I was under the influence of that brain-full of 5-MeO-DMT is a much harder experience to discredit. Did the spirit of my deceased friend enter the room? Or did my mind, supercharged from three months of regular 5-MeO-DMT smoking, project that image randomly into the ether? All in all, this was a heavy experience. I decided to take a break from tryptamine smoking so I could give myself adequate time to reflect on the variety of possibilities that this last experience had opened up. I no longer consider 5-MeO-DMT to be a “drug.” Rather, it is a sacrament. Smoking 5-MeO-DMT up to this point had been mind-blowing good fun and spiritually enlightening. But after this experience in New Orleans, my interpretation and understanding of it took on a deeper meaning. Journalist, photographer, and artist James Oroc was born in the small South Pacific nation of Aotearoa. Since 1998 he has been pursuing and reporting on the cutting edge of extreme sports in more than 40 countries around the globe, his work appearing in magazines, films, and on MTV Sports. He has been a member of the Burning Man community since 1999, and he is also involved in the documentation and advancement of “Alternative Culture.” Oroc resides in the Dominican Republic.